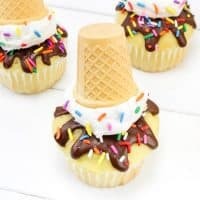 Melting ice cream cone cupcakes are easy to make and designed to look like an ice cream cone that fell upside down and is beginning to melt. I haven't been able to stop with the bright and colorful summer desserts lately. From watermelon rice krispie treats to clam shell cookies, we are on a summer dessert roll over here. 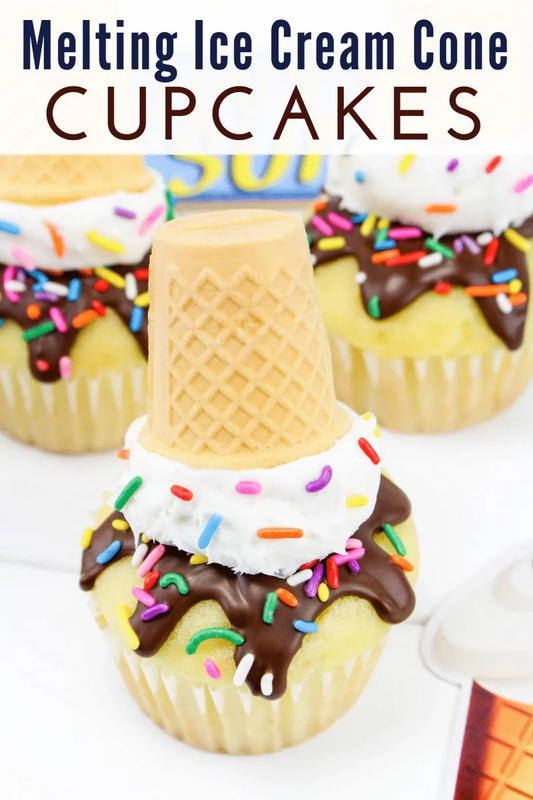 Today I have a super fun treat to share with you — melting ice cream cone cupcakes. Nothing is worse than getting a nice, big, ice cream cone, only to drop it on the ground. Ugh! 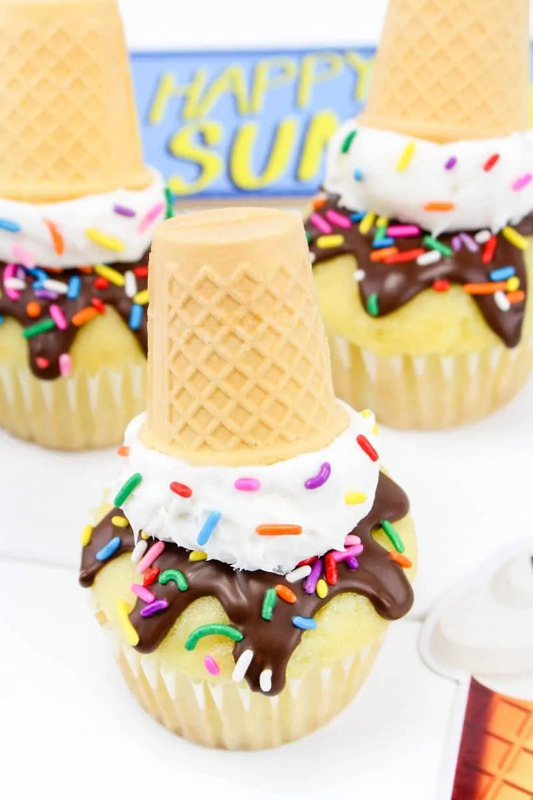 But these cupcakes — designed to look like dropped ice cream cones — are far from the worst. In fact, they are pretty darn adorable if I do say so myself. 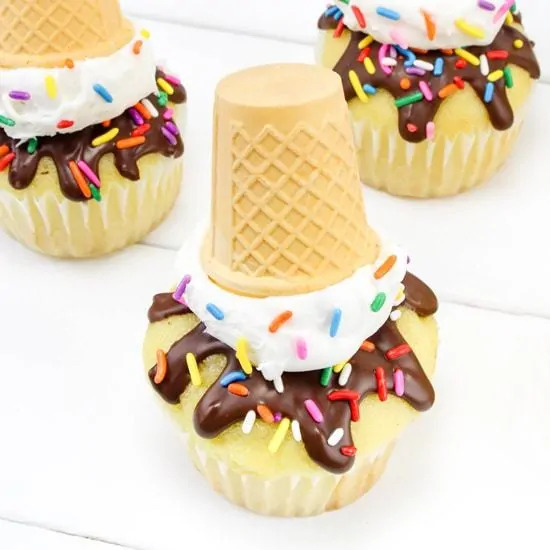 Perfect for all your summer parties, ice cream cone cupcakes are easy to put together starting with your choice of vanilla cupcakes. If you want to get fancy you can make your cupcakes from scratch, but it is not necessary. Boxed cupcake mix will work just fine. The hardest part of this recipe is cutting the rim off of the ice cream cones, since you have to be careful not to crack or crush your cones. Easy does it! 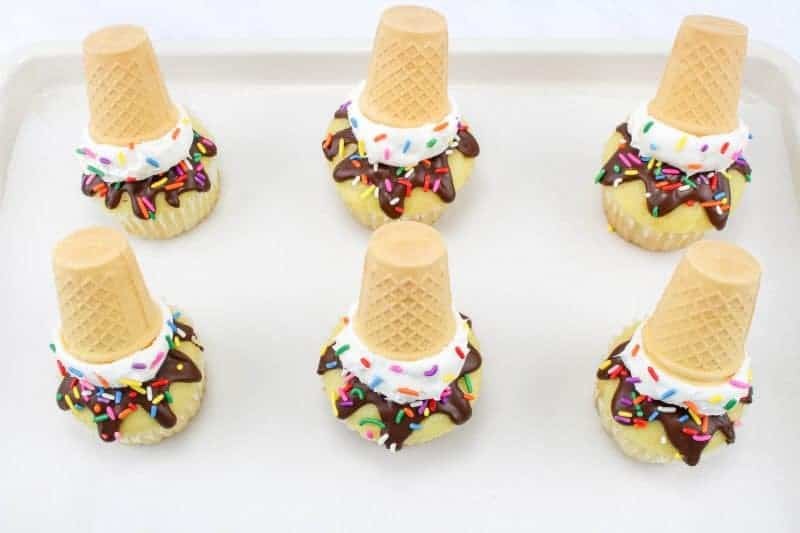 Once your cones are ready, simply top your plain vanilla cupcakes with melted chocolate. We used microwavable Baker's dipping chocolate for our cupcakes, but you could just use the melting chocolate of your choice. Use a toothpick to work the chocolate a bit and give it that drippy, melted, look. Then, scoop on the white frosting which will serve as your “ice cream”. Finally, press ice cream cones down into the frosting and add more sprinkles. Because you can never have enough sprinkles. If you are thinking of planning an ice cream party, these would be a great dessert option to serve along-side your ice cream. I know it is unbelievable, but there are in fact some people out there who don't like ice cream. Crazy as it seems, it is true. 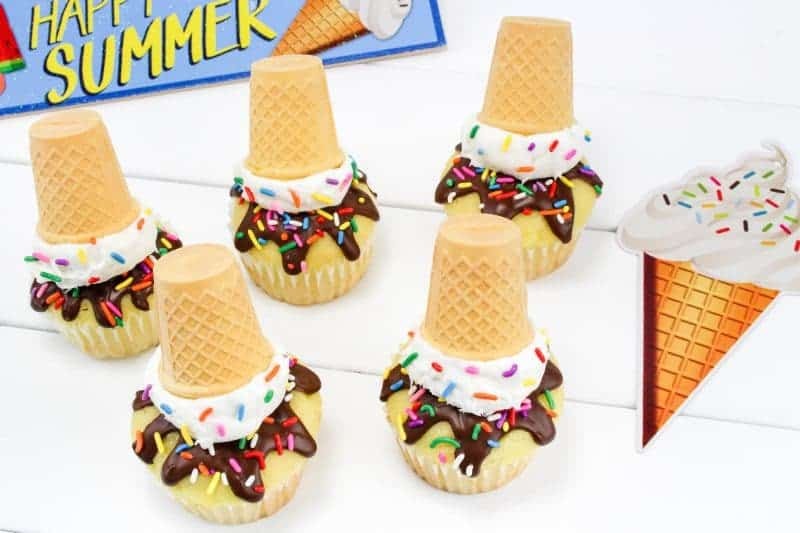 So, these cute ice cream cupcakes would be a great dessert option for those anti-ice cream partygoers. 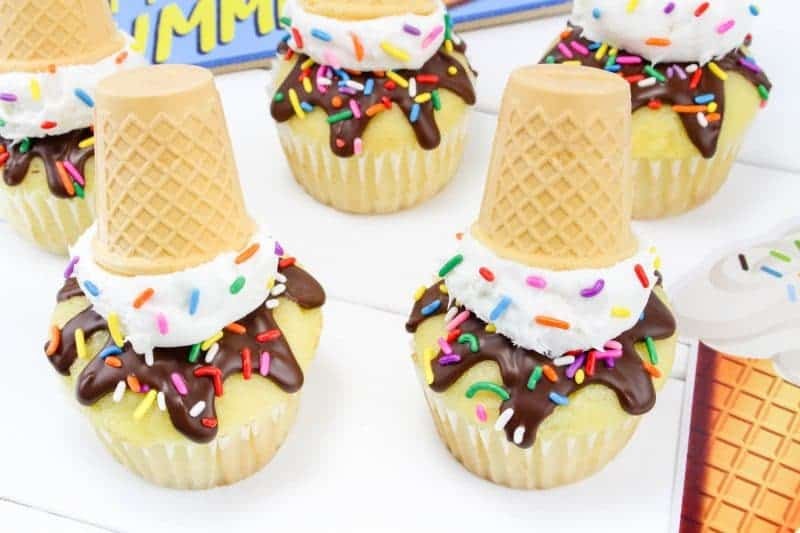 Melting ice cream cone cupcakes are easy to make and designed to look like a ice cream cone that fell upside down and is beginning to melt. 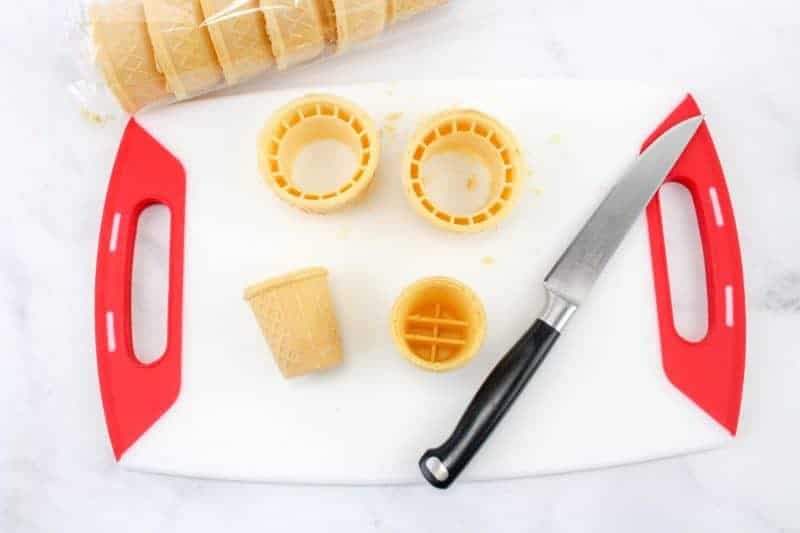 Using a sharp knife, carefully remove the top rim of each ice cream cone. Discard the rims, as you will be only using the bottoms for this recipe. Melt chocolate per package instructions. 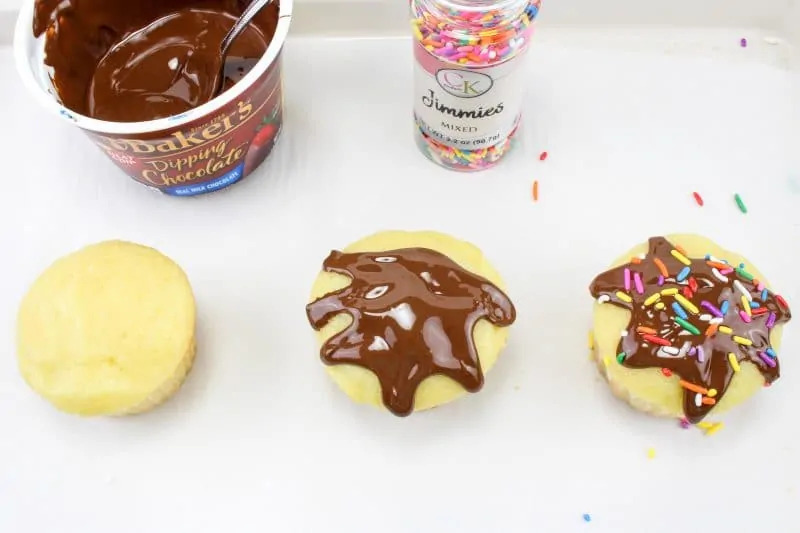 Using a spoon, pour a small amount of chocolate onto the top of each cupcake. Use a toothpick as needed to help spread the chocolate out and into "drips" going down the side of cupcakes. Add sprinkles immediately, before the chocolate begins to set. Allow cupcakes to set until the chocolate hardens (about 20 minutes). Using a small cookie dough scoop, add a scoop of frosting on top of the chocolate on each cupcake. 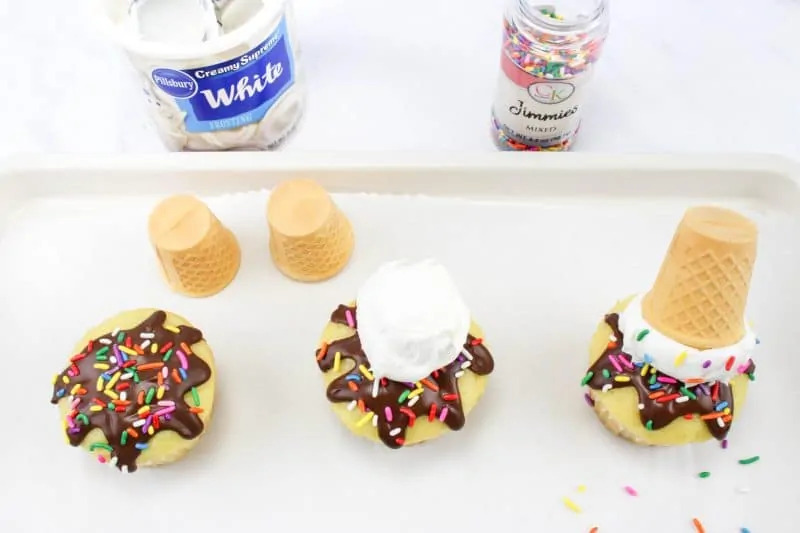 Gently press an ice cream cone into each cupcake, on top of the scoop of frosting. Finish by adding a few sprinkles to the frosting. These are SOOO cute! And a great idea for a bday party! These are so clever – I especially love the chocolate melting. What a fun treat for a birthday party! Ok, these are beyond awesome!! 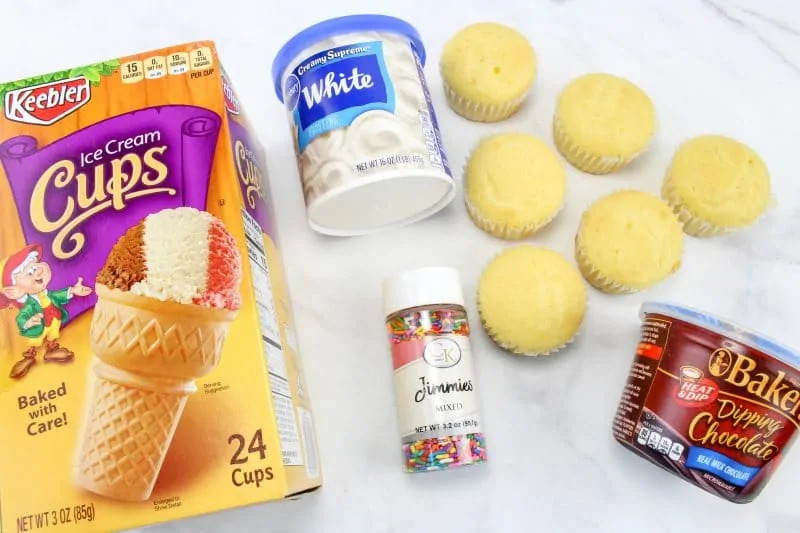 I can’t wait to try different cupcake mixes with this idea! Thank you for sharing! 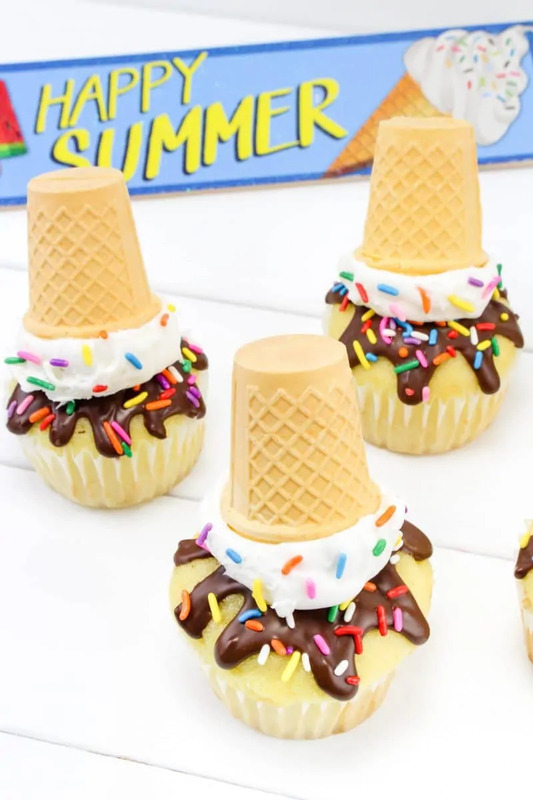 These cupcakes are super cute and creative too! I love how simple they are to make. Thanks for sharing. These cupcakes are adorable! So cute and colorful – simply delicious!